For companies such as Jack in the Box and hometown team Target, the costly Super Bowl spot is just the beginning of their campaigns. At Target's 'Bullseye Lodge' in Minneapolis. A commercial during Sunday’s Super Bowl LII broadcast is no standalone play for marketers. Many brands are using their ad buy - $5 million for 30 seconds - as a kickoff to a longer-term earned and shared media push. "I've probably seen 90% of the Super Bowl ads already, and what is under wraps is the PR element because that is where the real competition is on Sunday," says Caroline Dettman, chief creative officer, Golin. "The ad used to be everything, but now it is just part one. Part two is where you have the real creative challenge, which is how to earn a relationship with consumers from that ad moment and inspire them to take action on the brand's behalf." She adds that Golin has a number of PR plays ready for Sunday, but citing that competitiveness, declined to provide client examples. Jack in the Box is among the many brands that rolled out their Super Bowl spot this week. Its ad features a showdown between the restaurant chain's mascot and lifestyle maven Martha Stewart over Jack in the Box’s new line of specialty sandwiches. On Sunday, the brand plans to stage a Twitter feud between the two, hoping to draw fans into the back and forth with the hashtag #JackVsMartha. MWWPR is supporting the brand. "The goal with a Super Bowl ad is to turn it into a marketing campaign rather than it just being a 30-second ad," says MWWPR president Bret Werner, noting that People and Entertainment Tonight have reported on the ad's reveal. He contends that most of the Super Bowl ads he’s seen appear to be trying to start a marketing movement using humor or pop culture. "What we’ve seen very little of so far are ads leaning in politically," Werner says. "A brand that takes that opportunity in the marketplace could do very well." Werner acknowledges it is easier for brands to generate interest from media and on social media with a Super Bowl ad, but says it’s hardly a requirement for companies trying to leverage the plentiful comms opportunities that come with such a big event. "When it comes to PR, the Super Bowl is still underleveraged," he explains. "You have thousands of credentialed media onsite from all different genres looking for stories. The challenge is standing out by being creative and understanding the cadence of the Super Bowl to truly identify the white spaces for each brand. There are just certain time periods where you can't compete." He references media day and the press conference held by the NFL’s commissioner as two examples. Werner arrived in Minneapolis days before Super Bowl Sunday, working on location with Jack in the Box, Tyson Foods, and Coca-Cola Bottling. The latter has partnered with Carolina Panthers tight end Greg Olsen on media appearances. On Thursday, the football star did a two-hour media tour in Minneapolis promoting his community involvement with Coca-Cola Bottling. He was also booked on ESPN sports talk show Golic and Wingo, among others. 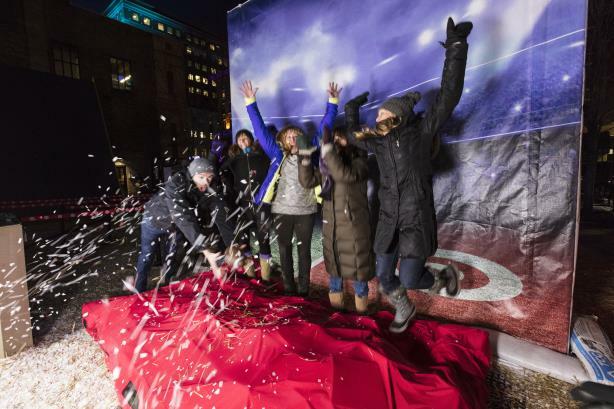 Target began planning its first Super Bowl activation six months ago. "This is a cultural event that is incredibly cluttered with a lot of brands doing a lot of different things, but with the Super Bowl being in our own backyard, we knew we had the advantage that comes with being a host brand," says Joshua Thomas, the retailer’s senior director, comms and PR. To welcome visitors, the retailer converted its Target Plaza Commons facility into the "Bullseye Lodge." It is the first time the employee plaza for meetings and recreation has been opened to the public. The venue has an ideal location, situated along the route of the Super Bowl Live fan experience downtown. The Bullseye Lodge offers visitors free hot chocolate with their faces digitally printed onto the marshmallow topping, as well as a host of fun photo ops. Visitors can be captured diving for a football or see their best touchdown dance projected into the light display at the top of Target Plaza, for example. "The experience was absolutely designed to be shareable beyond those walls, on Instagram and other social media," says Thomas. More than 20,000 people have passed through the experience in its first five days. Social media traction has also been strong, especially on Instagram, Thomas notes. Olson Engage is handling PR. Target also partnered on a capsule collection being sold at the Lodge with local clothing store, Askov Finlayson. The store's founders are brothers Eric and Andrew Dayton, whose great-great-great grandfather founded the company that would later become Target. Target also designed the uniforms for the more the 10,000 volunteers supporting the city with the Super Bowl festivities. In the coming weeks, we’ll be taking a look at the number of people who came through the Lodge, what sold and what didn’t, and how it performed across earned media and social as we think about the next activation we might have of this sort," says Thomas. "But we really don't have anything to compare it to. It is not often that you celebrate the Super Bowl in your home city." He notes any learning would be used to inform other activations for the brand, not to repeat what they’ve done. "Our approach to cultural moments like this is never formulaic. We would never lift and land a Bullseye Lodge into another time and space," Thomas points out. "It was really designed with the cultural considerations of the Super Bowl." While not local brands, Roy Rogers and Greene Turtle are both regional, community, and family-focused restaurant chains. Maroon PR has created a PR strategy highly targeted at local media, such as pitching cooking segments for TV and Super Bowl party-food suggestions for print and digital. Maroon PR is also working with bubble gum brand Big League Chew on local events, like bubble-gum blowing contests. "The Super Bowl is this big national story, and so national media can take over the host town a little bit," says Katy Ford, senior account executive at Maroon PR, who runs the firm’s sports division. "We feel it is so important to make sure local outlets who are there day in and day out are taken care of, because they are looking to flesh out their coverage with different stories."